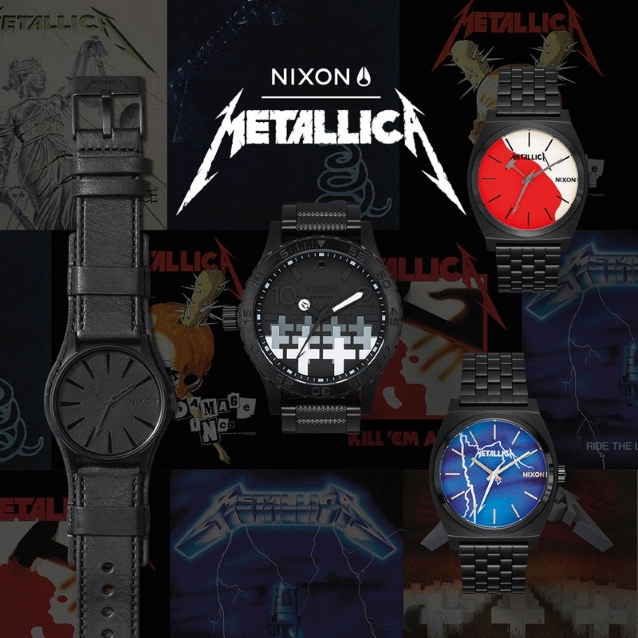 METALLICA recently teamed up with Nixon to launch a line of watches, each representing a classic album from the band's discography. The watches — which are now available — use "old guitar straps and leather jackets from various 'TALLICA members to create watch bands." The collection includes eight different watches embedded with iconic album art spanning from 1983's "Kill 'Em All" to 2016's "Hardwired... To Self-Destruct". "The fact that each and every one of the band members wanted to participate and did participate in the project was special, man," said Joe Babcock, Nixon's director of product, in a video detailing the collaboration. "Bringing that band's energy to life through our product and with our product was awesome." There are eight different models ("…And Justice For All", "Seek & Destroy", Black Album, "Ride The Lightning", "Kill 'Em All", "Hardwired… To Self-Destruct", "Master Of Puppets" and "Time Teller Pushead"), and one very special limited-edition "Sanitarium" make outfitted with a mangled "prison bar" cage. Prices range from $125 to $500. Founded in 1998 in Encinitas, California, Nixon is the premium watch and accessories brand for the youth lifestyle market. Focused on making the little stuff better, Nixon began with a small line of team-designed, custom-built watches sold exclusively in specialty boardsport and fashion retailers. Currently distributed in over 90 countries, Nixon's product range has grown to include select softgoods, leather goods, custom audio products and more.